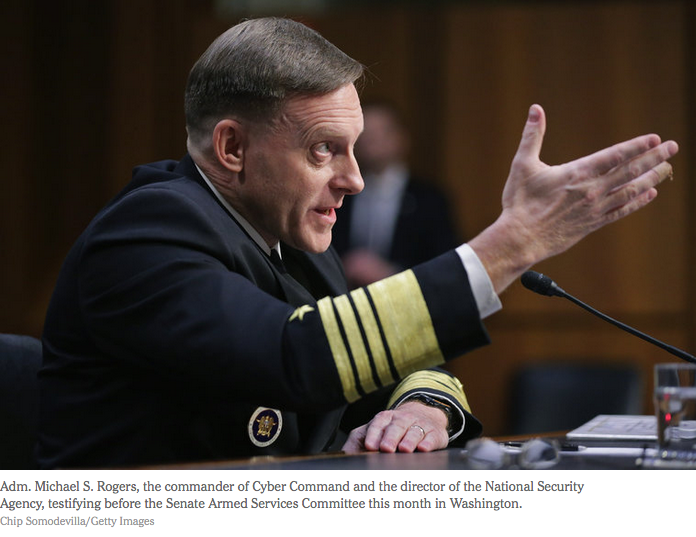 Does Cyberwar Mean Cyber PSYOP/MISO? The article focuses on the cyber mission of disrupting enemy communications and sowing distrust among potential recruits because their communications with the terrorist group are no longer secure. The use of cyber can be thought of as an extension of President Obama’s philosophy of avoiding the use of troops on the ground and of favoring special operations of all flavors. The article goes on to describe how these attacks are supposed to be targeting the money trail and by the use of cyber Military Deception (MILDEC). The article then goes on to discuss the balance between the action and the revelation of sources and capabilities. Conspicuously absent, at least in my opinion, were CyberPSYOP specifics. No one can deny that the Cyberattacks will have a psychological impact and are therefore PSYActs – but what about cyber oriented campaigns designed to hamper recruitment? When the article talks about ‘jumbling’ does it mean altering websites or Social Media to change the message from recruiting to warning the reader to stay away? What about specific cyber ‘leaflets’, e-mails, SMS, Tweets and other messages aimed at altering the behavior of the target? Clearly now that the cyber cat is out of the bag, these kinds of actions would seem more than appropriate – if not necessary ones. If any of y’all out there see any articles describing CyberPSYOP/MISO – please send the links my way! The April 11, 2016 New York Times ran an article “New Muppet Helps Give Afghan Girls Role Model” (see: http://www.nytimes.com/2016/04/12/world/asia/afghan-sesame-street-introduces-zari-a-muppet-and-role-model-for-girls.html?_r=0, which is also the photo source). “Zari” pictured at right will be appearing on “Baghch-eSimsim” or Sesame Garden in Afghanistan. The new character is being introduced to provide a role model for girls in a country not exactly known for its ‘equal opportunity’. I’m a big fan of Sesame Street, my kids grew up on it and I consider the Puppet Museum in Atlanta as one of my favorite places. I also believe that we acquire many of our values and habits while we’re kids, so the concept of using entertainment to convey messages and values makes a great deal of sense. In fact, two years ago I did a posting on Palestinian children’s programming (see: http://psyopregiment.blogspot.com/2013/04/early-influence-is-hard-to-overcome.html). Going back to Afghanistan for a moment – who is watching? According to the INTERNEWS project (http://data.internews.org/af-media/, the map source) 45% of the country owns a TV set, in a country where illiteracy is pegged at 41%. It should also be noted that there is a spillover factor to adult viewership as well. We could speculate that these 25 minute programs are aired during the day and that most of the adults home at that time are women giving Zari a twofer in empowerment messaging. It would be interesting to see if these programs are watched and if they have any long-term effects. If anyone has any research or references in the area of the influence of children’s programming – I’d appreciate the pointer. Last night my wife and I saw “Eye in the Sky” with Helen Mirren (see: http://www.wired.com/2016/04/eye-in-the-sky-modern-war-film/) . The film does a nice job of dramatizing the decision making behind the go/no-go decision for an attack. The scenario is set in Kenya, an ally. Helen Mirren, as a British Colonel has been tracking a British national who was radicalized, her husband and two new suicide bomber recruits. The plot leads all of the suspects to be in the same house at the same time in a militia controlled slum. The drama is moved along by having the audience identify with a local young (12?) girl who is selling bread outside the house. Mirren’s staff calculates a 65% certainty that the girl will be killed in a missile strike. Action goes back and forth until the two new suicide bombers are fitted with vests and explosives. Ultimately Mirren forces her targeting officer to lower his Collateral Damage Estimate (CDE) to 45% which she believes will turn the no-go into a go. Part of the arguments center on the propaganda value of the strike. The diplomats argue that killing the one girl gives the propaganda victory to the enemy while allowing the suicide bombers to strike a soft target and cause extensive carnage would give the allies the propaganda victory. While there was a flying cockroach like recon drone taking footage of the suicide bombers getting their vests – and of course everything was recorded, no mention was made of the need to justify the strike using that video. Worth your time and probably a good write off as a business expense!